We all walk ancientrails. Welcome to the journey. Ruth’s play was in the morning. We drove into Aurora to see it, close to the airport. We came back home, took a nap then went out for the No No’s crawfish boil. 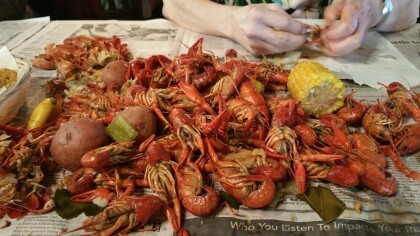 Well, I went for the crawfish boil and Kate came along as what the reservation referred to as a non-crawfish eater. We got there early so we saw the waiters put together four tops into single long tables, five of them. These tables got covered with thin plastic from a roll and the plastic got covered with what I’d expected, newspapers. After we were seated, waiters first brought small plastic containers of fried dill pickles. Wonderful. Next came gloved waiters with metal containers of boiled potatoes and slices of andouille sausage. They simply threw potatoes and sausage slices on the table for each person. Andouille is spicy and a real New Orlean’s treat. Finally, in the same metal containers came the crawfish, red and spicy from their hot water bath. The waiters tipped the containers over in front of us and small mounds heaped up. The room quieted as we all got to work. Early in our marriage Kate and I went to New Orleans for a continuing medical education event. It was notable for three reasons. The first and least significant was seeing a grumpy Jerry Lewis pushing a stroller off a plane at the airport. His family looked equally happy. Having been to New Orleans several times in the years prior to our trip, I wanted to see the area around New Orleans rather than stay in the narrow area of the French Quarter, so I drove out to the bayous. It was April. When I found a bayou that was also a state park, I pulled in, found the boardwalks and walked out into the swampy grassland. Much to my delight and surprise the bayou was full of blooming irises. They were everywhere. The alligators were just waking up, too. I saw several, moving slowly, trying to get their reptilian blood warmed up. They hunt nutria in this area and there were plenty of these large rodents. The alligators, however, were not up to speed and I witnessed many clumsy attempts by sleepy, cold alligators to catch one. The nutria, far faster than their not yet fully present predators, escaped easily. The last and most memorable moment of the trip came after I decided to drive around in cajun country and find an authentic cajun restaurant. I found one in a small town somewhere not too far from the bayou. I went in, it was in the middle of the afternoon, and I was the only diner in the place. A waitress came over and I told her I wanted to try some authentic cajun food. What would she recommend? I don’t recall the other things she brought, but she did bring me a plate of boiled crawfish, fresh from the bayou. And proceeded to peel them and feed them to me. It was odd, intimate and unexpected, but seemed perfectly natural. As I pinched off the tails of No No’s mounded crawfish and leveraged the meat out of them by breaking the small chitinous bands that held it in, I thought of her, that small restaurant, and all those irises. patchwork nation a demographic/geographic breakdown of the nation into 12 different kinds of community. Jessica Watson and Ella’s Pink Lady The 16 year old Australian girl who wants to be the youngest to sail round the world unassisted and solo. Jessica Watson’s Webpage with Map This is Jessica Watson’s website where she has a position map, a description of Ella and rules for her voyage. The Bottom of Heaven THE BOTTOM OF HEAVEN is a transcendent place in black American culture and thought, much like the blues, where ingenuity meets the absurd. Our blog borrows the phrase from the novel, Sula, by Toni Morrison. The Weather Doctor A site dedicated to Transcendental Meteorologist Henry David Thoreau among others. Woolly Mammoths A mens group, we’ve met together for over 20 years.